I’m Catherine Hope and I lead the team of Digital Performance Analysts working in Newcastle on the DWP’s retirement provision services. I’m also the DWP’s Data Presentation Champion, and get very excited by charts! I’m going to tell you about practicing what we preach – applying an agile, iterative approach to the way we share data with teams. Get your State Pension is a new service we’re building for citizens, it’s been in private beta since the end of January. We’ve invited over 3,500 people to use the online service so far. We use Google Analytics to do all of this. We gather, analyse and share this data regularly and frequently. In the team, we use data along with user research and customer feedback to make decisions, and to make and assess improvements to the service. 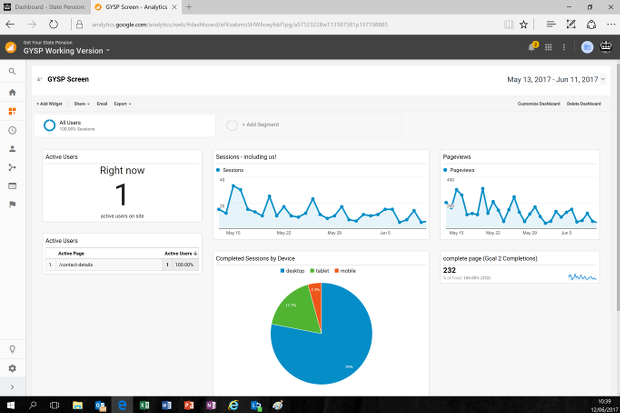 The dashboard (built using the Google Analytics dashboard facility) is the most visible. It’s permanently displayed on a large screen because it helps us keep track of what’s going on through the day. And it’s a good talking point for visitors too. the number of people using the service right now – I know, cool, huh?! To begin with it was really exciting to see when a user was accessing the online service. We watched the first user’s progress, willing them onto completion. We let out a cheer of success! The dashboard no longer met the needs of the team. We need to show metrics that lets the team learn what’s working well, what could be better and to improve. We decided to take the same approach to improving our analytics as we would for any of our digital services. I assessed what was on offer, gathered evidence about the use of our analysis products, re-examined the team’s user needs and iterated. The team and I were quite surprised by how much we do - we don’t just create reports from the digital analytics data. 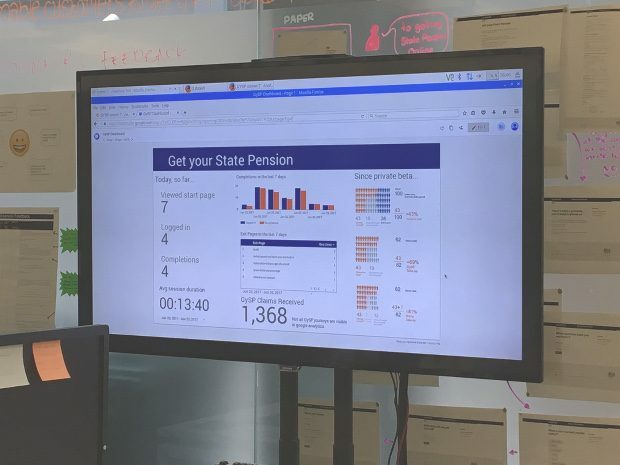 We also pull in data from our operational colleagues, analyse user feedback scores, and report ‘take-up’ (proportion of people that use Get your State Pension out of those who don’t). There’s a few ways of thinking about and measuring take-up, it’s pretty complicated. We’d already done some work on presenting the different measures, the team wanted to make them more visible. We moved away from Google Analytics dashboard, opting for a new dashboard built using Google Data Studio. Sarah, one of our analysts, realised the benefits on a training course. It meant we could include data from operational and administrative systems. We’ve had really positive feedback about it, and lots of people stop and look when they walk past. But the important thing is whether the team find it useful. When asked, the team all agreed that it was more useful than the old dashboard. They also said that take-up is easier to understand and explain to other people. The average session duration is proving useful to show a comparison to the current State Pension online service (users complete our beta service more quickly). The ‘Today so far’ section gives more context than the previous real time information. For example, we can see whether everyone who logged in managed to complete, or left part-way through. That’s great. But it doesn’t mean we’re done. We’ll keep reviewing it, and all of our other products, iterating them to make sure they continue to meet the team’s needs. Because data has users, and those users have needs too. Catherine Hope is a statistician and leads the team of Digital Performance Analysts working in Newcastle. She is also DWP's Data Presentation Champion. I have been trying to add feedback to Beta, just to report that the service is awful, worse than ever, but unfortunately unable to access the button for it. Your team has done some brilliant dashboards, but please allow the public to add feedback so all your great data is accurate. Since posting this I've made some more improvements to the Dashboard. The "waffle charts" of little people are now easier to count, thanks to advice from Andy Kirk @visualisingdata. We've also added the "Right Now" counter back on to the screen because the operational team found it useful. When the phone rings, they look at what page a user is on so they know what the question is likely to be before answering the call. This won't be as useful when more people are using the site, but it's a great user need. Often "Right Now" is something of a vanity metric. Great insight into your teams work! Excellent knowledge sharing Catherine. Please keep us up to date.